Many agents discriminate against hybrid brokerages for a range of reasons, according to a recent Inman survey. Bias sometimes stems from concerns about competency of hybrid agents and lower commissions. Practices include steering buyers away from listings and not promptly responding to showing requests. That was a response given on a recent Inman survey, which indicated that many brokerages discriminate against hybrid brokerages, realty firms that provide an alternative to the traditional brokerage commission and service model. Seven years after NAR agreed to abandon a policy that allegedly stacked the deck against industry mavericks, plenty of real estate agents continue to shun working with agents who hang their licenses with brokerages that often base their value proposition on charging discount commissions and using innovative technology, according to the survey. How widespread is hybrid brokerage bias? Four out of 10 respondents to Inman’s survey said they are generally less inclined to cooperate with a hybrid brokerage than a traditional brokerage, and 56 percent said that many agents discriminate against hybrid brokerages. The reasons traditional agents avoid hybrid broker listings vary, from receiving a lower commission to working with an unqualified agent who might tangle up a deal or create legal liability for agents involved. Perhaps the most common way traditional real estate agents avoid cooperating with hybrid brokerages is by steering their buyer clients away from listings represented by hybrid brokerages. Respondents suggested that agents typically do this when a hybrid brokerage is offering an unusually low commission split to a buyer’s agent for bringing a buyer to a sale. Traditional agents may also avoid cooperating with hybrid brokerages because, they say, hybrid brokerages tend to saddle traditional agents with most of the work in a transaction. I “don’t want to end up doing both ends of the transaction and get paid for one end,” said one survey participant. Some agents worry that working with a hybrid brokerage can even put them at risk of inadvertently representing the interests of both the buyer and seller in a transaction involving a hybrid brokerage — which could potentially expose them to legal risk. Antipathy towards hybrid brokerages may be institutionalized to a degree. 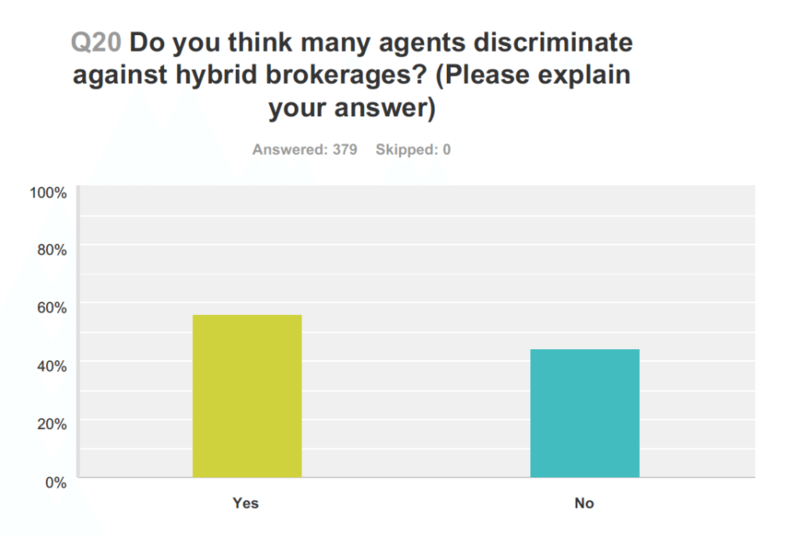 One respondent said agents are “taught” to discriminate against hybrid brokerages. Only 17 percent of respondents admitted to actually having advised a client against buying from or selling to another person represented by a hybrid brokerage. 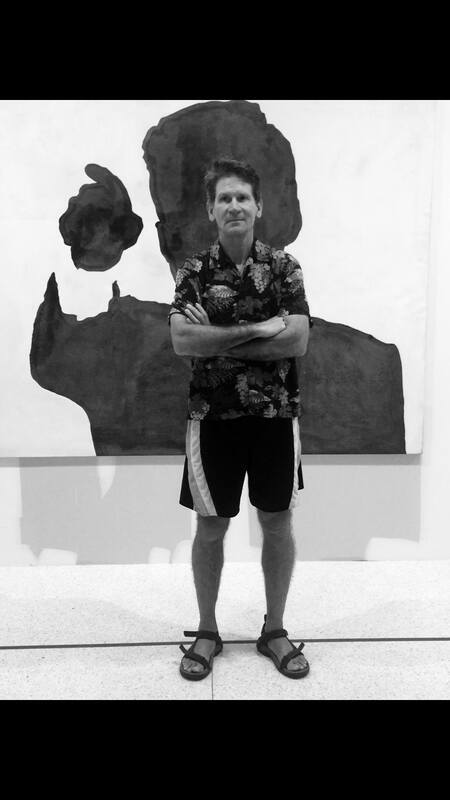 Calling attention to listings represented by traditional agents while downplaying those represented by hybrid brokerages or not responding promptly to showing requests from hybrid brokerages are other forms of covert discrimination practiced by traditional agents, Wendel said. Some real estate agents may discriminate against hybrid brokerages not just to avoid taking a pay cut or signing up for extra work, but also to avoid feeding the growth of businesses that they believe could negatively affect them in the long run. 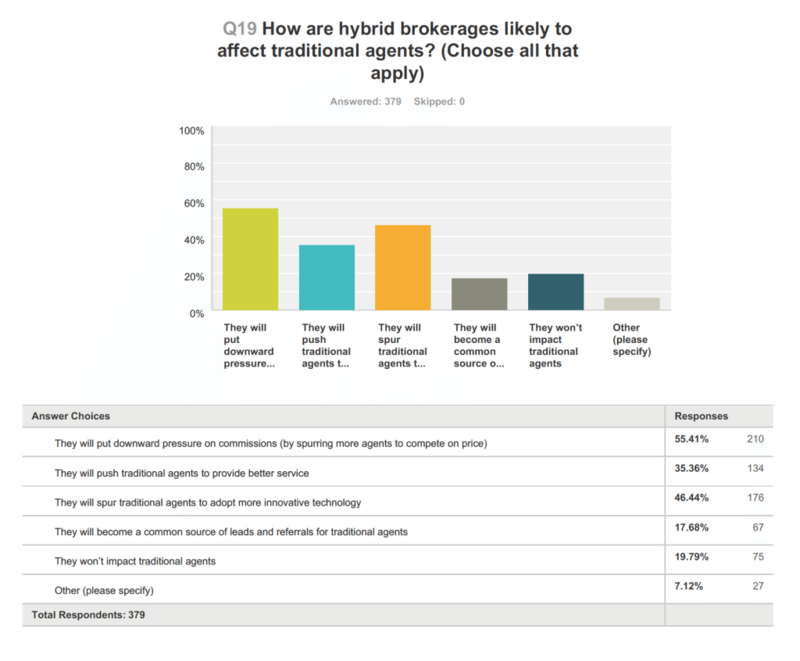 Asked if hybrid brokerages would negatively affect traditional agents, 44 percent of respondents said they would, while 41 percent said they wouldn’t. Sixteen percent said they weren’t sure. Perhaps traditional agents’ biggest concern about hybrid brokerages is that they could drive down commissions. Though most agents say they neither worry about hybrid brokerages nor consider them to be a growing force in the market, a majority of respondents (55 percent) said that hybrid brokerages will likely put downward pressure on commissions by spurring more agents to compete on price. 1. Even if hybrid brokerages don’t gain significant market share, their relative growth would still expose more consumers to lower commission offers, potentially leading more consumers to seek lower fees from traditional agents. “Large-scale brokerages like Redfin at a minimum can change consumer expectations, even if the model may not have long-term positive [effects],” said one respondent. “I don’t fear them but hate them for causing damage to incomes [because] they won’t be around for too long to feel the downward pressure on commissions,” said another. 2. Hybrid brokerages, some of which tend to burst onto the scene with aggressive marketing campaigns, sometimes disparage traditional agents in the process of promoting themselves. “The consumer already thinks we don’t work,” said one respondent. Hybrid brokerages “will make it worse.” Hybrid brokerages “give the perception that we are overvalued and can do more for less,” said another. Inman’s survey comes 10 years after the U.S. Department of Justice (DOJ) filed an antitrust lawsuit against the National Association of Realtors. The DOJ had claimed that the policy could restrict competition and consumer choice in real estate services, and discourage low-cost services. The real estate industry is likely riper for innovation compared to the years preceding the settlement, and Glenn Kelman, CEO of what is perhaps the most successful hybrid brokerage, Redfin, has said that resistance toward hybrid brokerages has diminished in recent years. But Inman’s survey leaves little doubt that opposition from traditional agents can remain a barrier for real estate innovators.